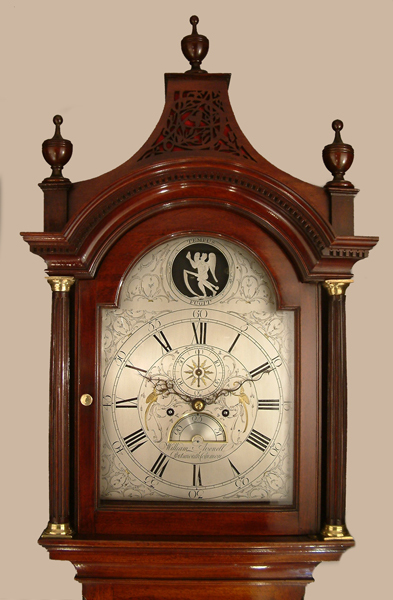 This Longcase Mahogany's Maker - William Avenell of Portsmouth Common - a scion of the well respected and prolific family of clockmakers who operated to unfailingly excellent standards throughout Hampshire for over two centuries.Please see LCMAH 247 in Archive section 2003 - 2006 and LCMAH 300 on current site.I always try to buy Avenell/Avenall clocks as and when they become available. Typical Portsmouth area long door, solid mahogany, pagoda top case having 3 turned wood urn finials, very good colour and patination, "silk" backed, pierced, central fret, dentil moulded detail under, "flying" fluted, brass capped, hood columns, breakarch top to trunk door, quarter moulded detail to trunk verticals and panelled base.All set on shallow bracket feet. 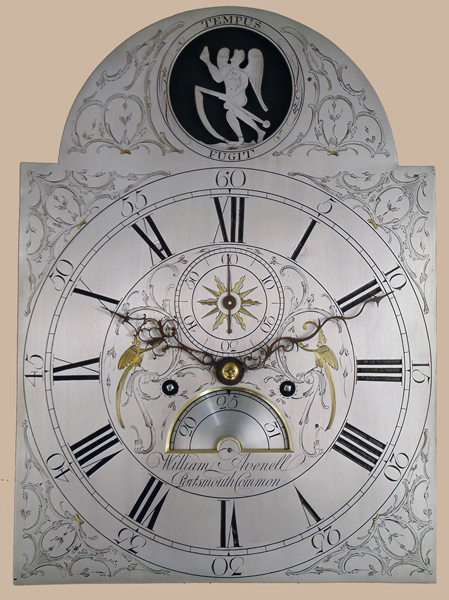 12" breakarch finely engraved and silvered brass dial with ho ho birds and scroll decoration. Automaton figure of father time to arch with motto tempus fugit ( time flies/flees ).Large date lunette.Blued cut steel hands. Typical "Avenell" high quality 5 pillar movement with hourly ( rack ) striking, the automaton figure driven via the pallet arbor.Typical Avenell high quality brass strip pendulum with "double brass" bob. William Avenell of Portsmouth Common - a scion of the well respected and prolific family of clockmakers who operated to unfailingly excellent standards throughout Hampshire for over two centuries.Please see LCMAH 247 in Archive section 2003 - 2006 and LCMAH 300 on current site.I always try to buy Avenell/Avenall clocks as and when they become available. 89.2" ( 226.5 cms. ) or 84.6" ( 215 cms. ) ex. central finial.